Eagles defensive tackle Haloti Ngata (center) with teammates defensive end Derek Barnett (left) and defensive end Fletcher Cox during a preseason game against the New England Patriots at Gillette Stadium in Foxborough, MA on Thursday, August 16, 2018. Tim Jernigan stood on the sideline at Eagles practice Wednesday wearing his No. 93 jersey and bucket hat, marking the first time he has been on the field for the start of the practice this season. The defensive tackle is recovering from a back injury that has kept him out throughout the offseason and the first two months of the season, and there's no clear date for his return. 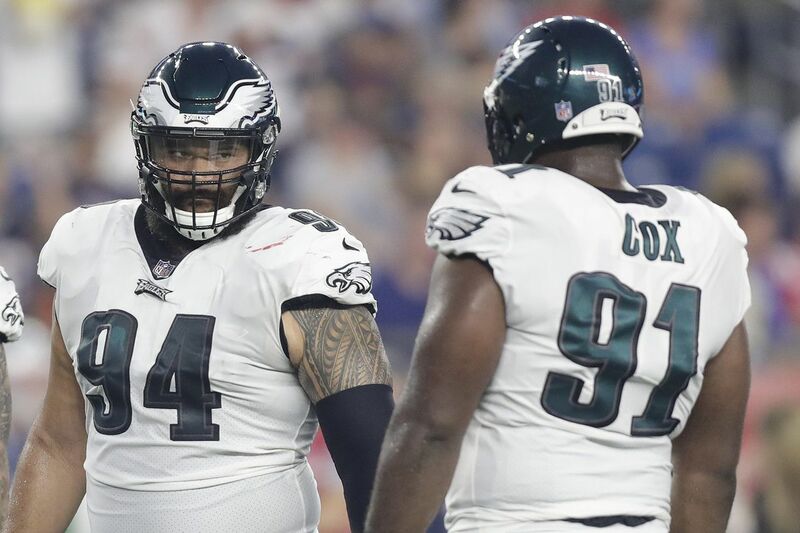 His absence has left the Eagles undermanned at defensive tackle throughout season, and their depth chart thinned even more this week when the Eagles waived Destiny Vaeao. They have only three defensive tackles on the roster: Fletcher Cox; Haloti Ngata, who has missed the last two weeks with a calf injury; and Treyvon Hester, who was promoted from the practice squad earlier this month. Ngata was limited at practice Wednesday, but it appears he's on track to return for Sunday's game against the Carolina Panthers. The Eagles need him, too, because for a team that likes to rotate defensive linemen, they are running out of tackles to rotate. "Right now, we do have a plan, but I'm not going to disclose the plan obviously [because] of the game and game week and all that," coach Doug Pederson said. "I would say that Ngata is getting close. He's day to day still. Getting better. We'll see where he is … later in the week." Jernigan, who is on the non-football injury list, is eligible to return this week. But Pederson said he is not yet ready to practice. The Eagles have been tight-lipped about Jernigan's murky status and clandestine injury since the spring, and there remains no indication whether he will even return this season. But it was at least a sign of progress that Jernigan watched practice. During the summer, Pederson said the Eagles kept Jernigan inside during practice to avoid accidental contact. "Tim just keeps progressing," Pederson said. "We're hopeful and optimistic, but at the same time, we want to make sure that he's healthy and … his safety is first." If the Eagles had Jernigan this season, the only questions would be about depth at the position. That's easier to stomach than their current predicament. Jernigan took 49 percent of the defensive snaps last season. Beau Allen, who left in free agency, played 41 percent of the snaps. So the Eagles had key players to replace, and they needed Ngata to remain healthy and one of their younger defensive tackles to emerge during training camp. Ngata, a five-time Pro Bowler who is on the tail end of his career, played a big role on the defensive line before the calf injury. He has missed time in each of the last six seasons, so the Eagles were aware of his injury history before signing him this offseason. Although he might not be the player he was earlier in his career, his presence would give the defensive line a notable boost. Vaeao, who had been on the team since 2016, did not emerge into a consistent player this season. The Eagles kept undrafted Bruce Hector at the start of the season before replacing him with Hester two weeks ago. The Eagles have grown keen on Hester, who was the Oakland Raiders' seventh-round pick last season and started one game as a rookie. Hester quickly earned a promotion from the practice squad and had two tackles while playing 23 percent of the defensive snaps Thursday against the Giants. Pederson called Hester a "big part" of the plan on the defensive line. "All I ever needed was an opportunity," Hester said. "I wanted to take advantage of whatever I can take advantage of and play my role." Hester, who is 6-foot-2 and 304 pounds and had five sacks as a senior at Toledo, believes he fits in the Eagles' penetrating defensive scheme. Cox called Hester "twitchy." Still, the Eagles' plans at defensive tackle going into the season didn't include a player who was waived by Oakland before the season and was on the practice squad in September. The Eagles use their defensive ends inside on passing downs, so Michael Bennett and Brandon Graham fill a part of the defensive tackle void next to Cox. But for a position that the Eagles value — and one that seemed to be in good shape after Jernigan signed a lucrative contract extension last season to remain next to Cox — they are lighter than they'd like to be. The trade deadline is at the end of the month. Unless the Eagles make a move, they'll need Ngata to stay healthy, Hester to continue developing, and hope that Jernigan can recover to feel comfortable with their depth behind Cox. And on Sunday, they'll rely on the three they have. "I think we'll be fine," Cox said. "The biggest thing is we have some D-ends that can fill in that spot. …We've got other guys who can come in and fill the position. I feel pretty good about it."